The Albany UK website has a soft launch period at the moment so we'll be monitoring how the site stands up with some top-heavy scripts. There are some known issues with Internet Explorer 8 and the Featured Content Gallery so this may be reviewed depending on feedback. 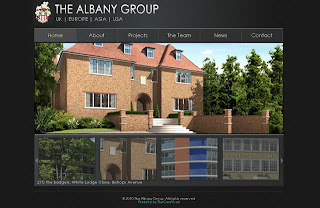 The website is a bespoke design update to the previous site and includes Ipix and Flash virtual tours, press-releases, past and present property projects, modal contact form, textured navigation, search engine friendly urls, interactive slideshow and image carousel, and information about the team. Thanks to this useful mime types work.